Adrenal gland, Cortex - Atrophy in a female Sprague-Dawley rat from a chronic study. The width of the cortex (C) and the overall size of the gland are decreased; the capsule (arrow) is thickened by fibrosis. M = medulla. 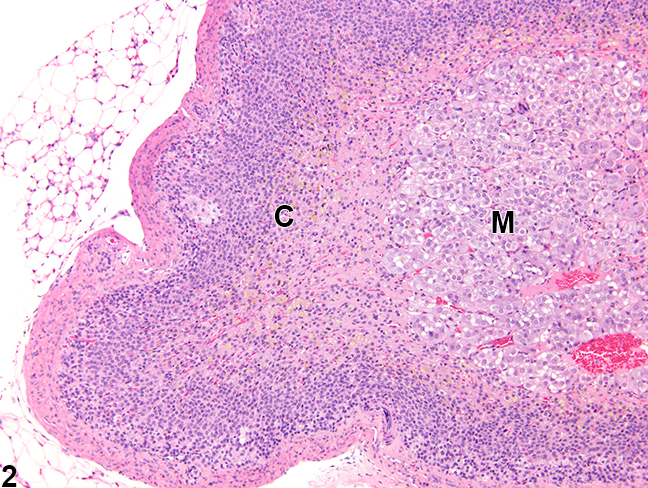 Adrenal gland, Cortex - Atrophy in a female Sprague-Dawley rat from a chronic study (higher magnification of Figure 1). The width of the zona fasciculata is decreased, and the cell nuclei in the outer zona fasciculata are crowded, suggesting a decrease in size. C = cortex, M = medulla. 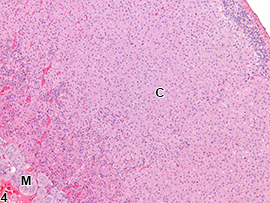 Adrenal gland, Cortex - Normal in a female Sprague-Dawley rat from a chronic study. A normal adrenal gland at the same magnification as Figure 1 is shown for comparison. C = cortex, M = medulla. Adrenal gland, Cortex - Normal in a female Sprague-Dawley rat from a chronic study. A normal adrenal gland at the same magnification as Figure 2 is shown for comparison. C = cortex, M = medulla. Adrenal cortical atrophy ( Figure 1 and Figure 2 ) may be focal or diffuse. Compared with the normal adrenal cortex ( Figure 3 and Figure 4 ), the atrophic cortex is characterized by reduced thickness of the one or more of the cortical layers due to a decrease in cell size or a loss of cells. The zonae fasciculata and reticularis are more often affected than the zona glomerulosa. There is variably decreased overall size of the gland, often with distortion of the gland outline. The glandular capsule may be thickened due to fibrosis ( Figure 1 and Figure 2 ). Causes of adrenal cortical atrophy in rats and mice include any factor that increases levels of glucocorticoids, such as exogenous administration or endogenous hypersecretion by a functional adrenocortical neoplasm in the same or contralateral gland, which secondarily results in decreased adrenocorticotropic hormone (ACTH) levels. Atrophy can also result from more direct ACTH deficiency, such as may occur with abnormal pituitary function. Cortical atrophy can also be a direct effect of exogenous toxicants that interfere with normal adrenocortical steroidogenesis and/or the physiologic effects of the renin-angiotensin system on the adrenal. Because of the complex physiologic interactions of hypothalamus, pituitary, thyroid, and gonads with the adrenal gland, other exogenous toxicants and experimental manipulations that directly damage these tissues or modulate their secretory functions can result in secondary effects in the adrenal cortex, including atrophy. 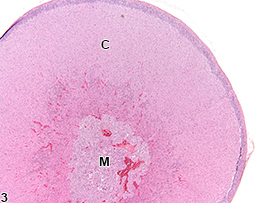 Cortical atrophy may also be a sequela to other pathologic processes, such as degeneration or necrosis, and may also be concurrent with cytoplasmic vacuolization or pigment accumulation. Adrenal cortical atrophy should be diagnosed and assigned a severity grade and distribution modifier (i.e., focal, diffuse). Associated lesions (e.g., cortical degeneration or capsular fibrosis) should not be diagnosed separately unless warranted by severity. 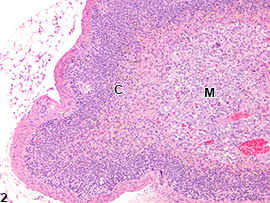 If atrophy is seen in both adrenal glands, the modifier "bilateral" should be added to the diagnosis (lesions are assumed to be unilateral unless otherwise indicated). Conran RM, Nickerson PA. 1982. 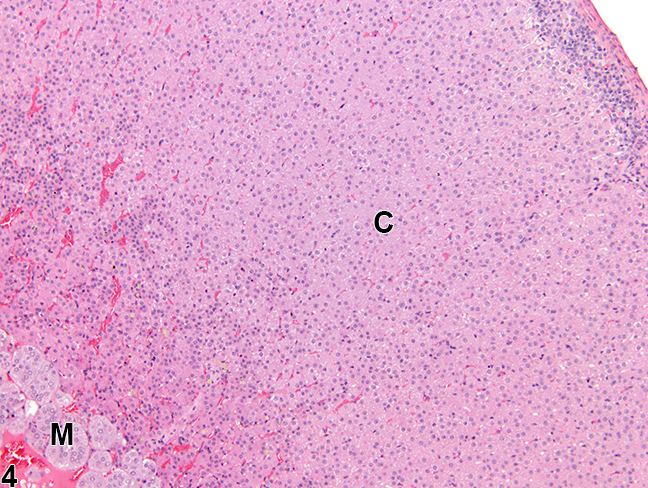 Atrophy of the zona fasciculata in the adrenal cortex of thyroparathyroidectomized rats: A quantitative study. Am J Anat 164:133-143. McEwan PE, Lindop GB, Kenyon CJ. 1996. Control of cell proliferation in the rat adrenal gland in vivo by the renin-angiotensin system. Am J Physiol (Endocrinol Metab) 34:E192-E198. Mirsky ML, Sivaraman L, Houle C, Potter DM, Chapin RE, Cappon GD. 2011. 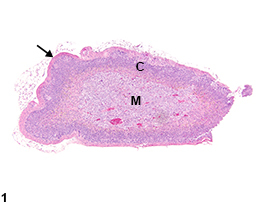 Histologic and cytologic detection of endocrine and reproductive tract effects of exemestane in female rats treated for up to twenty-eight days. Toxicol Pathol 39:589-605. Stachiwiak A, Macchi C, Nussdorfer GG, Malendowicz LK. 1995. Effects of oxytocin on the function and morphology of the rat adrenal cortex: In vitro and in vivo investigations. Res Exp Med 195:265-274.